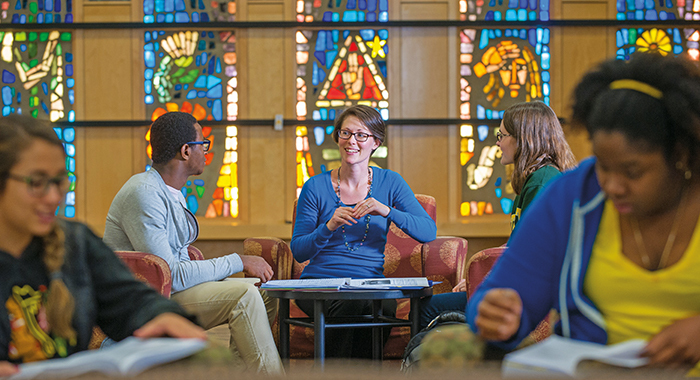 Kathleen Elkins (Theology & RS) works with students in Todd Wehr Hall. The St. Norbert College endowment has received an unprecedented gift honoring the legacy of Donald J. Schneider ’57 in serving the community and advancing Catholic education. Schneider was the president, CEO and chairman of Schneider National; a St. Norbert College student, alumnus, trustee and adjunct instructor; and a person deeply committed to the Catholic faith and values, says President Brian Bruess ’90. For decades, Don and Pat Schneider have made possible mission-focused work to advance Catholic education, including at St. Norbert College. 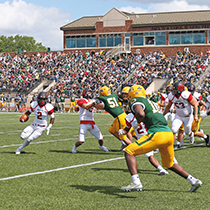 Their support enabled the college to establish the Donald J. Schneider School of Business & Economics and a new Master of Business Administration (MBA) program, as well as the new athletics stadium. Before his death in 2012, Don Schneider was an outstanding leader and visionary in faith, in community and in business, says Bruess. Don shared his time and talents with a wide range of academic, industry, business and community organizations including the United Way of Brown County, the Catholic High School Foundation, Notre Dame Academy, St. Norbert College and the Green Bay Packers. The Donald J. and Patricia A. Schneider family gift of $30 million will be applied to the St. Norbert College endowment. An endowment allows an institution to exercise good stewardship and helps safeguard its future. An endowment at St. Norbert College can be used for purposes designated by the donor or can be undesignated. The payout rate for an endowed fund is approved by the board of trustees annually. Endowment income can provide for scholarships, faculty positions and operating funds, and for programs like study abroad and undergraduate research. Endowment gifts can also fund ongoing commitments like endowed professorships, coaching positions and building maintenance. Typically, endowment funds are managed prudently to yield more than the targeted return requirement, to include an amount of growth to keep up with inflation. For many colleges and universities, including St. Norbert at this time, the payout amount is approximately 4.5 percent of the endowment’s average asset value.